A freelance writer for more than 30 years, D.M. Gutierrez has had nonfiction, fiction and poetry published in women's, mystery, academic, children's, disability and teen print publications and websites including "Psychological Reports" and "Highlights for Children." She has an advanced degree in psychology from the University of California at Davis. If your knee hurts when kicking a soccer ball, patellofemoral joint syndrome is the likely cause. 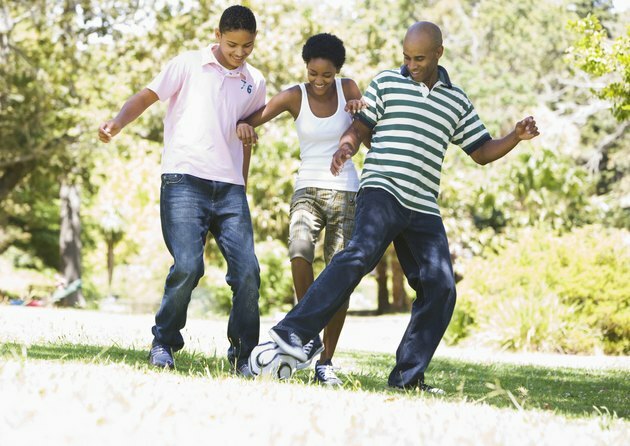 PFJ is quite common in soccer players, according to the Physiotherapy Sports Injury Clinic. Knee pain also can result from an anterior cruciate ligament injury, a meniscus tear or bursitis in the affected knee. Treatment for knee pain includes stretching or strengthening exercises specific to the condition causing the pain and sometimes surgery. Patellofemoral joint syndrome occurs when the patella, or kneecap, has difficulty gliding over the femur, the thigh bone that connects to the knee joint. Pain is not usually preceded by any specific injury or movement, but occurs over time. With PFJ, you feel pain on the side of your knee next to your other leg and a tightening of the knee joint. If your thigh muscles, or quadriceps, are not strong enough to stabilize your patella, you can also feel like your leg might give way. Cracking or popping sounds often accompany bending the affected knee. If your anterior cruciate ligament tears, you are likely to feel knee pain when kicking a soccer ball. Your ACL is the ligament that connects your thighbone to your shinbone. ACL injuries are common in athletes playing sports where changes in direction are rapid, such as roller derby, downhill skiing and soccer. More than 200,000 ACL injuries occur in the United States each year, according to the American Academy of Orthopedic Surgeons. If you put your weight on one knee and then twist suddenly, you can tear your meniscus, a protective cartilage. Tearing this rubbery shock absorber causes pain in the knee, tenderness of the affected area and swelling. Sometimes a piece of the torn cartilage gets in the way of the knee joint. When this happens, your knee might feel tight or you might not be able to straighten your leg all the way. Because you have two menisci in each knee, you can feel pain in either the inside or outside of the knee joint. Patellofemoral joint syndrome can usually be treated with exercises to straighten the thigh muscles. Exercises that stretch the quadriceps are also often prescribed by sports medicine professionals, according to physical medicine and rehabilitation specialist Dr. Shane Mangrum. Meniscus tears often heal on their own with rest, ice, compression and elevation. If the tear causes leg instability, surgery is usually recommended. ACL tears that don’t lead to instability of the leg can be treated with intensive physical therapy. Otherwise, surgery — the substitution of a tendon harvested from another joint — has an 85 to 95 percent rate of returning the knee to full flexibility and strength, according to the American Academy of Orthopedic Surgeons.